Yesterday, I went down to Jimmy's Farm in Suffolk for my Hambassador inauguration. A hambassador is an ambassador of British pork and the Red Tractor logo so where better to host the day but at the spectacular pig farm. As a hambassador I'll be bringing you tasty pork recipes, attending local pork events, meeting great producers and generally celebrating great British Pork, it's going to be an exciting year. The day started with introductions to the other hambassadors (I'll have a whole post introducing the other three hambassadors for you soon) a great bunch of porky enthusiasts all coming to the role from a different angles. Then we had a chat with Jimmy Doherty and a personal tour of his farm followed by photos in the sunny Skinny Jeans garden. 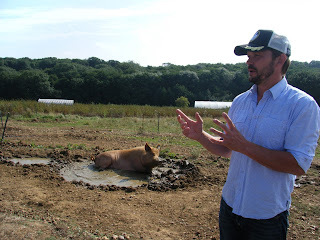 Jimmy is so passionate about his pigs and their welfare, it was an absolute joy to listen to his stories as toured us through the fields of pigs. There were even some adorable piglets, I really wanted to bring one home. Next, we had a butchery demonstration from Keith Fisher. I'm really interested in butchery and like to think I'm pretty handy when it comes to tackling a chicken but a pig is a pretty hefty undertaking. It was just us hamassadors so there was plenty of time for questions, we didn't get through all of the pig but we did learn plenty of ways to present the ribs. Spare ribs, short ribs, rack of ribs or baby back? I was starting to get hungry. Fortunately lunch was up next. 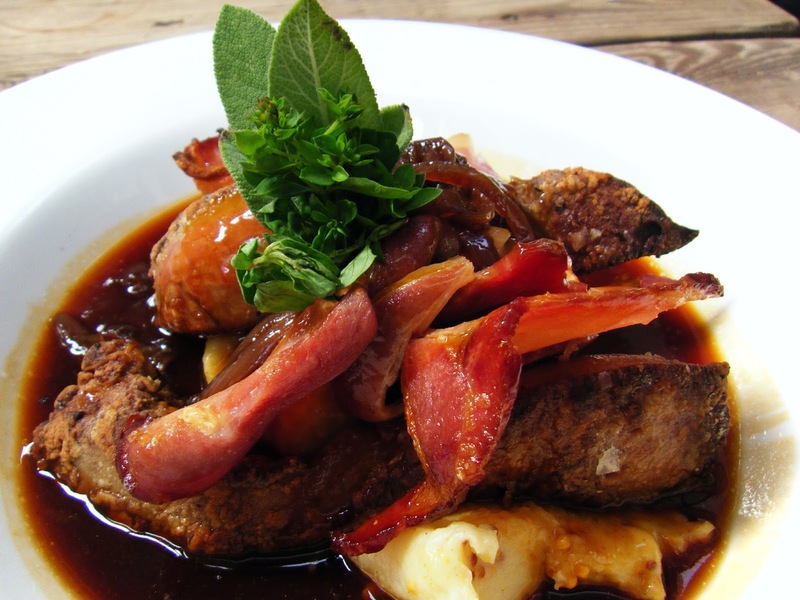 The restaurant at Jimmy's farm is housed in a beautifully converted barn adorned with festive blue bunting. Earlier when we had been chatting Jimmy was hard pushed to name his favourite cut of pork but he did say it was difficult to beat a good bit of pork liver and bacon. As soon as I saw it on the menu I was sold. It was the best pork liver I have ever tasted, sometimes I find liver is so irony it's almost metallic but this rich liver wasn't like that, it was beautifully tender, almost creamy tasting and Jimmy was right the crispy bacon complimented it perfectly. It was an amazing day and I can't wait to get cracking with more hambassador adventures. Do you know a great local pork producer or someone that is doing amazing things with pork that I should feature?